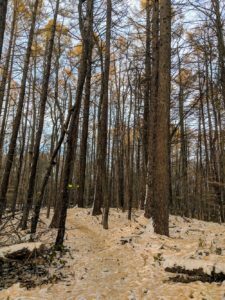 Early snowfall provided a delightful wintry setting for our 4-mile hike through the enchanting woods at this protected Nature Preserve. We traveled on a perimeter trail throughout the Northern portion of the property, starting with the Jenny Glen boardwalk, then climbing the Hawk Ridge Trail to the connecting Long Trail, to a fun lollipop trail on the Backwoods Loop, and returning to our start via the Rusty Stove and Kettle Pond Trails. Amidst the forest footpaths we enjoyed the red pines, white pines, balsams and hemlocks. The tamarack trees (also known as larch) were at their gorgeous golden peak color, being the only conifer that loses all their needles in the Fall. On the fresh white snow we were treated to a golden carpet of the fallen tamarack needles. You never know what beautiful sights Nature will provide! We enjoyed a snack break at the impressive Arboretum that holds many exceptional labelled trees including white and red oaks, redbud, and witch hazel. 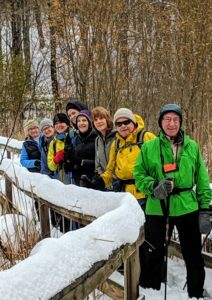 It was a wonderful way for our group of 9 to launch the winter hiking season!